The beach front Aegli Hotel enjoys a central location 200 meters from the harbor of Loutraki and within a short walk from bars, taverns and mini markets. 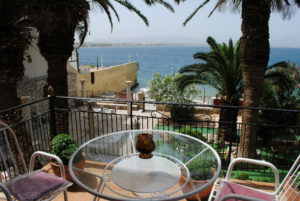 It offers rooms with views over the sea or pool and serves buffet breakfast in the morning. Located right on the beach, Aegli rooms are spacious and they all have a private balcony. They are equipped with air conditioning, a TV and they have an en-suite bathroom with hairdryer. Upon arrival, guests are offered a welcome drink. They can also get a drink or coffee from the on-site bar and enjoy it on the spacious living room featuring marble floors and a TV. At only 10 meters, you will find the municipal Loutraki Thermal Spa, while the falls of Loutraki are at 200 meters. The main square is also 200 meters away. Free WiFi is available throughout.